Pin #1, Engine Car, Black trimmed in Yellow with Black Guitars on Wheels. Pin #2, Light Blue Car with Music Notes. Pin #3, Light Blue Car with Red Guitar. Pin #4, Light Green Car with Saxophone and Music Notes. Pin #5, Light Pink Car with Bongo Drums, Drum Sticks and Music Notes. Pin #6, Red Car with Piano Keys. Each Train features the HRC Baltimore 2007 Logo and each Train connect's to each other w/Hooks. 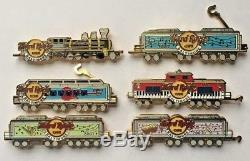 The item "2007 HARD ROCK CAFE BALTIMORE COMPLETE (6) PIN LE300 TRAIN SET" is in sale since Tuesday, March 06, 2018. This item is in the category "Entertainment Memorabilia\Music Memorabilia\Rock & Pop\Artists H\Hard Rock Café\Pins". The seller is "hardrockstore_robert" and is located in Hamden, Connecticut.